Main application of the HT-jigger is the dyeing of polyester, polyamides and mixtures of these fibres with cotton. This classical High Temperature Jigger, with a batch diameter of 1200 mm (Type HT 1200), is in operation with leading textile companies in different countries all over the world. In order to meet constantly changing end-user requirements Vald. Henriksen has introduced 2 dimensions of Jiggers, one with a bigger batch diameter (1400 mm) as well as one with a smaller batch diameter (700 mm). All jiggers are equipped with the unique drive system which accurately maintains fabric tension and keeps track of shrinkage as well as elongation. These features guarantee crease-free running, and accurate sampling. The advanced process control system for temperatures, chemical dosing, liquor ratio and process time guarantees first time right processing and full reproducibility. The HT-Jigger works with temperatures up to 143°C (289°F) and is able to dye synthetic fabrics without environmentally unfriendly carriers. Pre-treatment is a critical phase in textile finishing. Consistent desizing, scouring and bleaching is the basis for reproducible and high quality results for any form of dyeing and printing. Vald. Henriksen Jiggers are equipped with the process control systems, the mechanical running properties and the washing capabilities needed to meet the highest pre-treatment standards. The Vald. Henriksen Jigger has a unique washing mode, based on the combination of a low bath level and a continuous water supply, according to actual machine speed and fabric weight. During every single passage the fabric passes through water with very low contamination at any time. The maximum exchange created by this situation increases the washing efficiency, combining low water consumption with even and reproducible results. The result of the dyeing process is determined by 4 main parameters: temperature, time, concentration of dyestuff and liquor ratio. The Vald. Henriksen Jigger controls all these parameters within tight tolerances based on stored process recipes. Batches of the same fabric type will always be exposed to the same liquor ratio and the same process time, irrespective of batch length. The continuous dosing system maintains constant concentration for dyes throughout the process. The result: side to center differences and tailing are a thing of the past, while reproducibility and first time right results become the standard. The Vald. 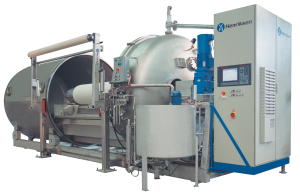 Henriksen Jigger facilitates crease-free running of any type of woven fabrics at speeds up to 150 m/min. This is realized by a highly accurate pre-set tension control using a unique mathematical formula. This combination makes it possible to operate in a wide tension range with very low tension fluctuations, ensuring good and even penetration of liquor while avoiding crease-marks.